First off, I want to thank Lynne from The Patchery Menagerie for the inspiration. Reading her "Bird How-To" was the first step in making my own little flock. You will need two fabrics for the wing/body of the bird, a scrap of orange, two brown scraps and a background fabric. I chose to make the background scrappy. Choose a background piece of fabric and a "wing" fabric and cut them into a square or a rectangle of the same size (this decision will impact the shape of your bird). Stack them with right sides facing up and eyeball a diagonal cut. You will end up with fabric for two birds. Choose a coordinating strip of fabric for the bird head and body. Snip off a section for the head, for the body and two pieces to notch the wings. Position the two pieces of fabric on the wing for a stitch and flip. Sew, then press open. After pressing, trim the shape back to a triangle and then snip off the excess wing fabric from the back. Doing it that way means you can just use your scissors while you sit at the sewing machine! Sew the wing piece to the background piece. Next, use a scrap of background fabric to make a notch on the bird's body. Stitch, press open and then trim using the method described above. Choose a strip of background fabric and a small orange scrap for the beak. Stitch, press open and trim. Repeat for the other corner. Choose another background strip to sew around the head. I lined the background strip up with the top of the head when I sewed it on because I knew that the head was looking a little large and that I would end up trimming it down. Better. Match the seams to the body, pin and sew. Choose a background strip and two brown scraps for the legs. Eyeball the placement of the legs and make two cuts into the background strip. I like the way it looks when the legs are angled. I pressed all the seams one direction so I could get a narrow leg without a lot of bulk. Straighten the edge of the leg section and body section and sew together. Trim the edges, and you have a finished block! I turned my little bird into a new pincushion. them! Have fun making your own little flock. 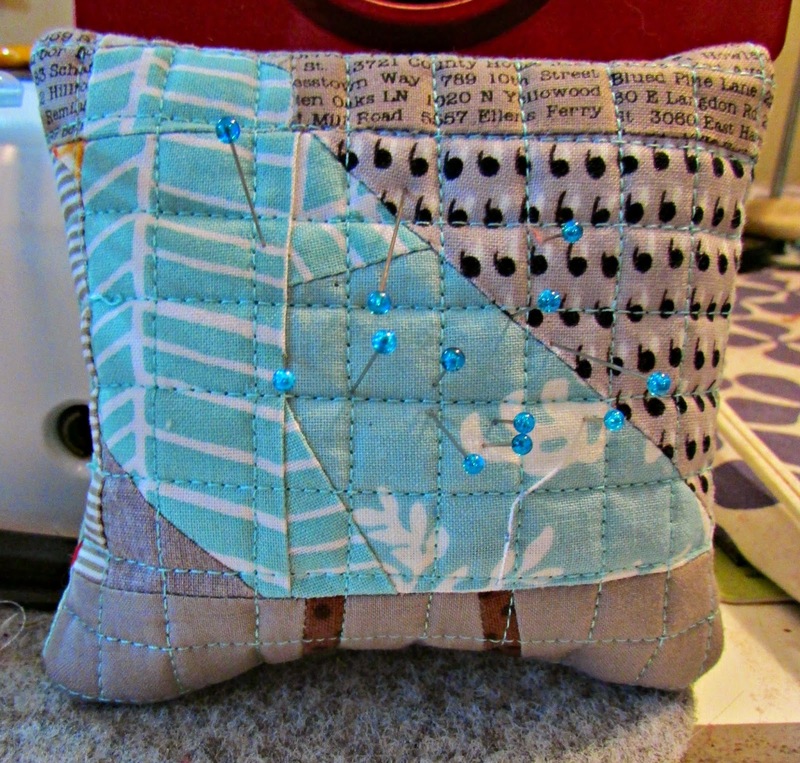 Great tutorial and I love that it has a paper pieced look but is strictly an improv block. Thank you for sharing this! I've been admiring your birds :) I love getting new ideas for fun improv piecing, I will definitely have to try this out! Thank you for writing this as a tutorial Jill!! I love those little birds. I want to put one on every quilt! Thanks for linking up on Toos and Tutorials Tuesday! So enjoyed your red birds at guild. Thanks for sharing with us Jill. It's about time for the birds to return. Thanks, Pat! I hope you make something so you can have bird any time you want. I just made my first bird using your tutorial. Your birds are really nice. and I can't stop at just one! This just looks like too much fun - thanks so much. Perfect, thank you!!!! I can't wait to make my own chickadees! It worked like a charm! Now I need to make about 30! But one will do for my project right now. THANK YOU!! I made my first two birds the other day, using your tutorial. It was very helpful to me. I'm grateful to you and Lynne from The Patchery Menagerie! Hey You ... I love this Tutorial and your Birds ... here are my version ... http://zickizick.blogspot.de/2016/03/ein-wunderbarer-tag.html ...Thank You for this Inspiration. Thank you SO MUCH! I adore your quilt and want to jump off into improve myself. This will help my newly retired self do just THAT!